Many women in the Gulf, say they prefer Qatari men. They are considered to be gentle, romantic, well dressed, and completely giving. Qatar's goal is to be the central transit point for Asia. Qatari men's head-dress (Ghitra) is usually white and have two black tassles. (These are nicknamed tea-bags). The way that the Qatari style of wearing the Ghitra is also known as 'The Cobra'. Qatar used to share it's currency with Dubai. Yes, it was called the Qatar and Dubai Riyal. It is NOT true that you must cover your body up in Qatar. You can wear a bikini at the pool or beach, you can wear short shorts, and you are free to show of your fashion. Qatar is the first country in the Gulf to fine Pedestrians for not walking correctly on the pavement. Those who put their lives at risk are fined QR200. Qatar has the world's largest Gas Reserves. 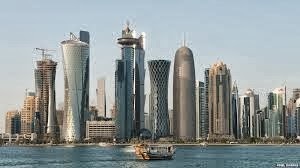 It is the main reason why Qatar is developing into such a modern nation. Qatar is one of the safest countries in the world! It's true, it's safer than Japan for example. Qatar's flag used to be red! The story goes that a manufacturer was supposed to create a batch of flags. However an experimental red dye was used. When the flags were all put up, they turned a Maroon colour. The country decided to adopt it. This shade of Maroon is now known as Qatar Red. Qatar is the first country in the Middle East region to support Digital Television! Yes you can watch DVB-H signals on your mobile phone.